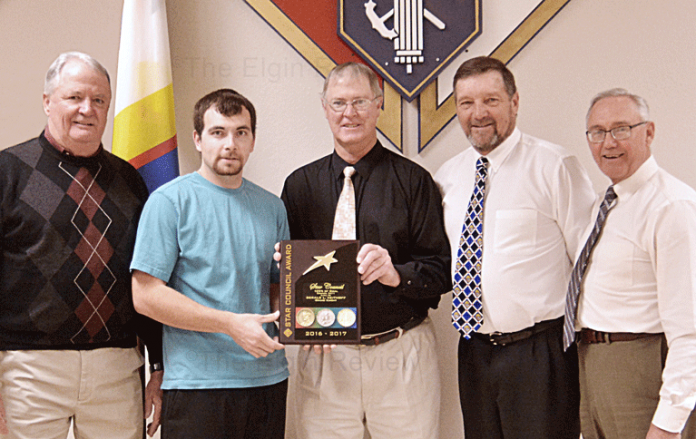 Knights of Columbus Council 2411 of Elgin has earned the distinction of Star Council of one of the organization’s top awards, for the 2016-2017 fraternal year. The organization’s headquarters, located in New Haven, Connecticut, made the announcement. The award recognizes overall excellence in the areas of membership recruitment and retention, promotion of the fraternal insurance program and sponsorship of service-oriented activities. The award was presented to membership representative Gary Hoefer by State Deputy Lou Gasper at the Mid-Winter Meeting held December 2-3 in Columbus. “Receiving the Star Council Award is quite an honor for us. We are extremely proud of the accomplishment,” proclaimed Bob Schiltmeyer, head of the local council. The Knights of Columbus is the World’s largest Catholic lay organization. It provides members and their families with volunteer opportunities in service to the Church, their communities, families and young people. With more than 1.9 million members in over 15,000 councils around the world, the Knight of Columbus annual donates more than $177 million and 75 million hours of service to charitable causes. Please visit www.kofc.org for more information.